Nourish blood, disperse wind, relieve mental uneasiness, providing nutrition to hair. 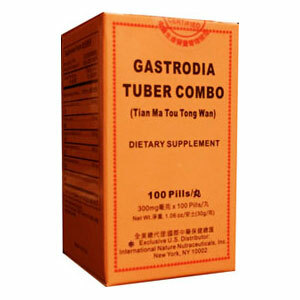 Tien Ma Tou Tong Wan supports the health of the brain and the nervous system. Other Ingredients: Honey, Corn Starch FD&C Red No 4. Dizziness, hemialgia, headache, migraine, neurasthenia, insomnia, mental depression, numbness in the extremities, white hair, and hair loss at early stage. Take 6 pills, 3 times a day.